While writing this article Tuesday morning, it was a beautiful day. Harvest is underway and several farmers are trying to make hay one last time before the weather finally changes. It looks like rain and cooler temperatures are on the way. I am not sure when we will have our first frost, but we are close to the time that we may see one for Greene County. Soon will be time to harvest any last garden produce prior to frost and now is a good time to harvest sweet potatoes and squash. There is still time to remove and compost old crop residue and plant a cover crop in your garden. I am pleased to announce that on Nov. 9, join us to learn about GMOs as well as the myths and facts of heirloom, hybrid, and grafted plants! This workshop will offer educational presentations and dinner. Topics from guest speakers include an introduction to GMOs and the science behind them. As well as myths and facts about heirloom, hybrid, and grafted plants to distinguish between types of vegetables. The event is $20 and advanced registration at go.osu.edu/greenegmo is greatly appreciated. It is also the time to start thinking about moving houseplants back inside. This should ideally be done over a two-week period. Moving your plants in shadier and shadier conditions is best so when they are finally brought inside to stay, they will not lose all the new growth they have made over the summer months. It is also a good time to check and see if any of them need repotted. This project is easiest if done outside to keep down the mess. A new pot should be only one or two sizes bigger than the old one. Select pots with good drainage to prevent root rot during the winter months. Some yellowing of leaves and leaf drop may occur as the plants adjust to lower light levels in the home. If a significant number of leaves yellow, move the plants into brighter conditions. Cut back on the frequency of watering, but water thoroughly. Discontinue fertilizing until spring, but plants that need lower light such as African violets can be fertilized during the winter months if they are receiving adequate light. For our lawns, if you raised your mower deck in the late spring, now is the time to lower it back down. For most grasses, we can now mow at 2-2.5”, while during the summer, we should have our decks a half inch higher off the ground. If you still want to make a last fall fertilization, over the next month is a good time to do that, and then only ½-1 pound of actual nitrogen per 1000 square feet. I think the warm weather is about over and cold weather is on the way. With the way trees have started to change color over the past week, I wonder if this weekend will peak color or if it will be next weekend, or if we will have much color at all? To end up today’s column, I will finish up with a quote from Calvin Coolidge: “I have never been hurt by what I have not said.” Have a great week. – Oct. 30 – Applications due for New Master Gardener Volunteer Training Class. – 5 p.m. Nov. 9 – GMOs, Hybrids & Heirlooms Workshop, OSU Extension Greene County. CFAES provides research and related educational programs to clientele a nondiscriminatory basis. For more information, visit cfaesdiversity.osu.edu. For an accessible format of this publication, visit cfaes.osu.edu/accessibility. 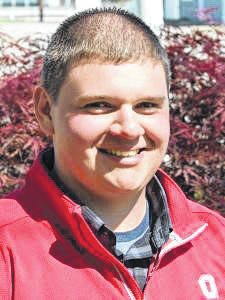 Trevor Corboy is the Greene County OSU Ext. Agriculture & Natural Resources Educator and guest columnist.